“The Fantasyland Train Station,” one of the three stops for The Walt Disney World Railroad. Dumbo, one of the circus’ most famed acts, flies guests around the Big Top area – featuring shiny new red and gold colors (inspired by ‘50s- and ‘60s-era tin toys), newly-created signature illustrations from one of the animators of Disney’s “The Little Mermaid,” and a beautiful new water feature circling the base of the attraction – a first for the Magic Kingdom Park attraction. 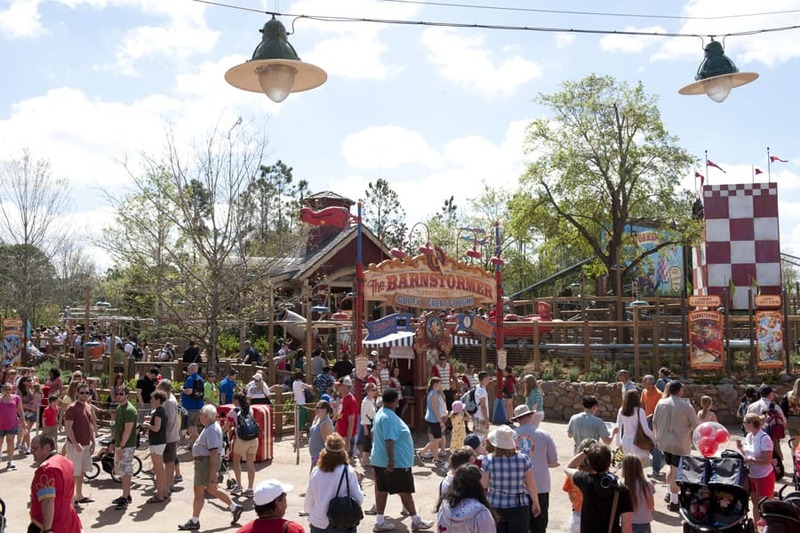 The Storybook Circus has just set up shop and peanuts, hoof and paw prints can be seen in the walkways – remnants of the circus animals and guests milling about the area. The Great Goofini, the circus’ stuntman, presents for guests one of his most daring stunts – The Barnstormer – which features an amazing array of aerial acrobatics. Some of the Great Goofini’s other stunts can be seen in posters around the circus area including “Bear Wrasslin” and “Aquamaniac.” The stunts and posters are a tip of the hat to some of the great Goofy short subjects of the ‘50s and ‘60s. And the Fantasyland Train Station design pays homage to both the elegant train travel of America’s past and Disney history, complete with a Casey-Junior-inspired weather vane and Carolwood Park sign, with “Fair Weather Place,” a nod to “Fair Weather Route,” Walt’s tag line for the Carolwood Pacific Railroad, the steam engine Walt Disney had running through his backyard. The attractions are in what we, in the biz, call “soft opening,” which means that they will be open at certain times and not at others. This is just the first phase in what will become the largest expansion in Magic Kingdom Park history – nearly doubling the size of Fantasyland. 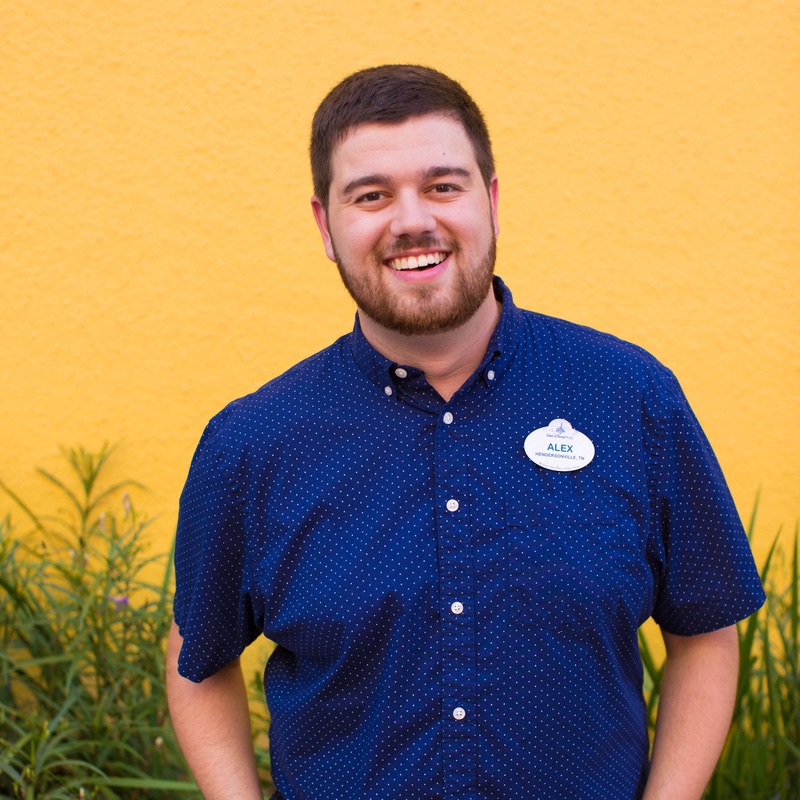 Stay tuned to the Disney Parks Blog for updates! I’m so excited about the new fantasyland! I’m bringing my 3 year old daughter in December. I hope the Beauty and Beast section will be open by then. That’s her FAVORITE movie!! I was just wondering are there any plans for food carts; guest dining experiences, or quick service locations in Storybook Circus. I miss the frozen lemonade at the town fair market location at Mickey’s Toontown fair! When is it scheduled to be completely open? My family and I and coming April 13th – April 20th and can’t wait to see the progress…So exciting! Still expecting someday for the People Mover to be updated it seems like there is so much potential for it and as the name says it really can handle crowds. We are planning a trip for November 2012. Do you think most of Fantasyland will be open by then? Also, I heard the MK map has been updated. Where can I find it? What’s the name of the artist who did the new signature illustrations for Dumbo that worked on “The Little Mermaid”??? 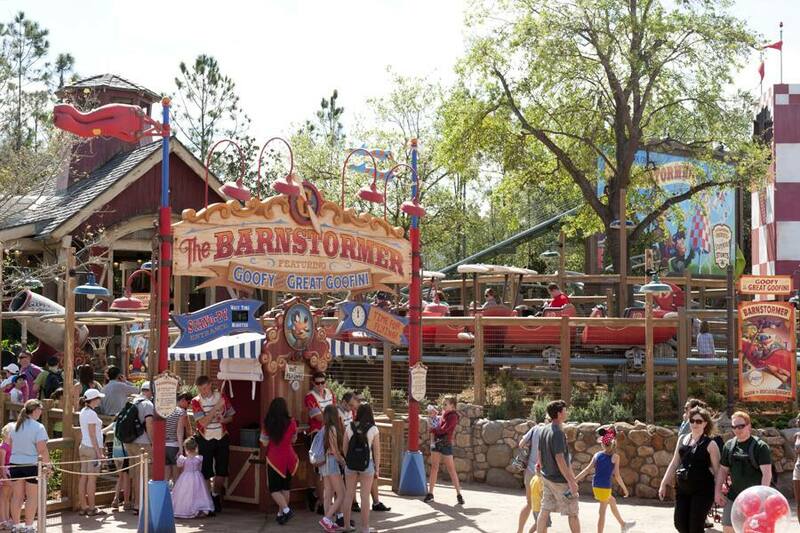 My daughter Loved the Barnstormer and was Devastated when it closed, but i showed her the pictures!! she is so excited!! we are coming end of May, Any word on the Ariel Ride?? thats my favorite!! 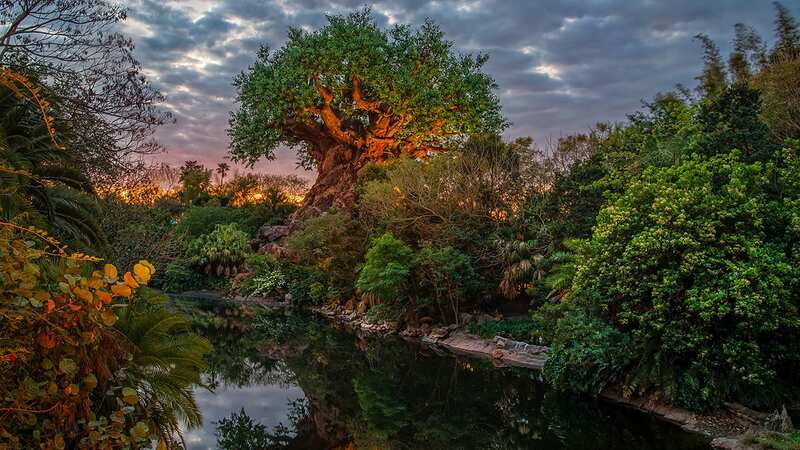 Thank you so much for all you do to continue to make these parks more, and more magical for all of us. We went to Florida for our second honeymoon (15 years) last February. One day we went and visited Toon Town Fair, and the next day when we went back…it was gone! I was heart broken. I am so glad to have pictures from that last day and to get to take a photo of my sweetheart and I in the heart shaped arch of Minnie’s gazebo! Now I can’t wait to come back and see what NEW magical memories I can create! I just hope it doesn’t take us 15 years to make it to the other side of the country again! Thanks again for creating a place where we ALL feel special! I was just there yesterday 3/17/12. The place looks great! The line for the Fantasyland train station and the Barnstormer was horrible though. However yesterday was just crowded in general so I have a feeling these lines will get shorter and shorter. I am really looking forward to seeing the entire area opened. I recommend that if you are going to go to Fantasyland get their when the park opens because it seemed a lot of people waited until the afternoon to head that way. I thought I read somewhere that the 2 new Dumbo rides were under the big tent. What goes in the tents? Are Mickey and Minnie’s houses still there for the kids to walk through? That was one of my little one’s favorite parts of the old Mickey’s ToonTown. I sure hope they haven’t gotten rid of those….the houses were so cute! My family and I are going to be at Disney from April 14-21st. Do you know if other attractions in the New Fantasyland will be open then? My daughter is 3, so we were really looking forward to taking her through what was Toontown, Minnie’s House, etc. Is Snow White still closing the end of May? I’ve read where the whole New Fantasyland will be open completely by “late 2012″…will it be open for my annual Christmas trip in the second week of December? My family will be visiting from GA during the week of April 1 thru the 8. Any idea if any of the Magic Kingdom attractions will be open? my little girl is dying to see the princess and my 2 year old boy is starting to like Mickey. We are coming week of April 10-15, what parts of “New Fantasyland” can we expect to be open? Will the rides already mentioned be the only new rides open? Thanks! Trying to plan a trip to Disney World in October. What is the approximate opening date for the princess section and Beauty and the Best restaurant? We are visiting April 14-21st this year, will any of the new Fantasyland be open? Yay! My five-year-old son jumped up and down and yelled when I told him the new train station is in Fantasyland now. He can’t wait to visit! We were there in november and saw the new fantasyland being built.We are coming back next week and was hoping that Fantasyland is now open? Is Fantasyland finished completely and opened to the public? No, New Fantasyland (the new section) is opening in phases as construction continues. 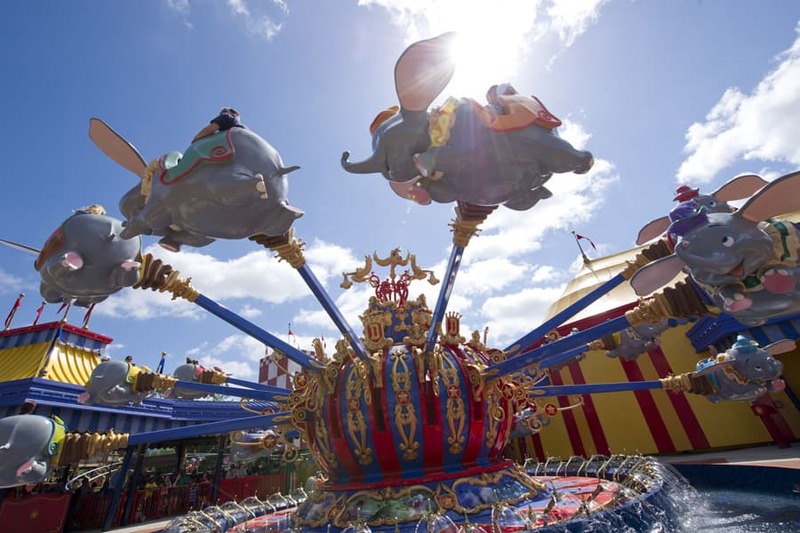 The first phase – Dumbo and Barnstormer – just opened this month. I have a question…Since they are opening this new Fantasyland, is the old Fantasyland still open?…..Like what about the Teacups, Peterpan, Snow White, etc…are those rides still open?…And my son and I will be there the first week of September….Will the new Fantasyland be open by then? Yes, the “existing” Fantasyland you remember is open. What we call “New Fantasyland” is a whole new area that is being added on. It looks beautiful, but I am a little sad that the iconic “riding Dumbo with Cinderella’s Castle in the background” photo is no more. Also…why is there no Timothy Mouse up there on the top? Did I miss him somewhere? Will Dumbo be open next week (March 22/23)? The photos look amazing!! We were so bummed out that Dumbo closed right before we vacationed there this past January! 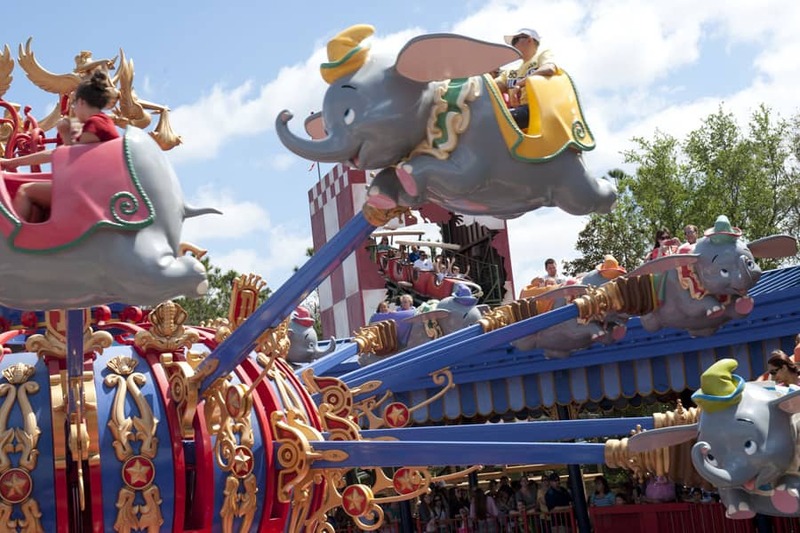 Riding Dumbo was one of my most vivid childhood memories of the Magic Kingdom, and I was so looking forward to passing that memory on to my daughter and grandchildren. We are returning in December, and I was wondering how much of the new Fantasyland will be open by then? I don’t have a date yet as to when the next opening will occur…but December is still quite a way off. Keep watching the Disney Parks Blog. I had no idea! Perhaps that’s the reason why it made me sick when I was 5. I’ve mastered it since then, just for the record. Dumbo has been counter-clockwise all along? I’m so excited about the expansion! I think it will be wonderful!! Can’t wait to see what’s open when we go down in December!! That’s a great attitude to have, Michelle! We can’t wait until the area is complete. I know the Imagineers are very excited to share it with guests, too! SOOO excited about the new Dumbo and Goofy Roller Coaster! Can you tell me the height requirements for Goofy’s Barnstormer? The line for Dumbo looks so much better under shade of the awning. The old line was so hot to stand in! I just verified that it is 35″. When does Storybook Circus officially open? By “late March” is the only description I’ve been given. This just made me being up extremely late all worth it! My kids will be super happy in August when we go. Thanks!!!! Brett, hopefully. Disney uses ‘soft opens’ to shake out the bugs and test queue arrangements, among other things. They might not with Cars Land, or they may soft open it a bit at a time. With such a large land… who knows? It looks so cool! The Dumbo looks more beautiful than I could have imagined. 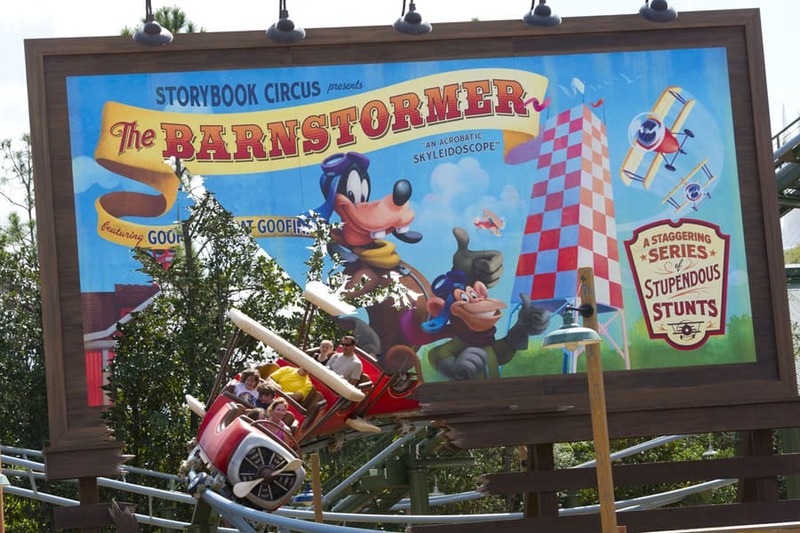 I wanted to go on the Barnstormer when I came in August, but I’m glad I’m waiting until my next trip. It looks much better now. Does Goofy’s little monkey sidekick have a name? Do you have a ball park date for the Beauty and the Beast Restaurant? That is going to be so awesome! Not yet. I’m working on it. Keep checking back! 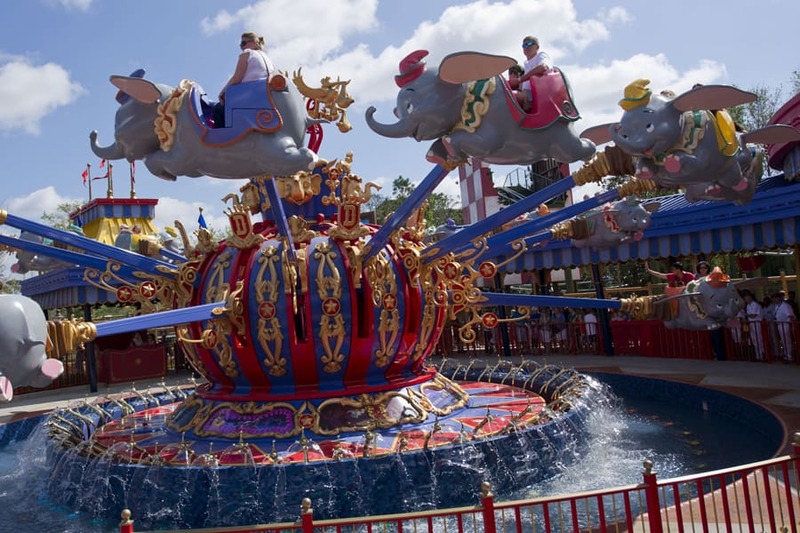 We will be going to MK on 3/29/12, do you know if they will continue to do the soft opening of Dumbo and Goofini??? My little Princess was very upset when I told her Dumbo was closed & all my nephew’s have talked about is riding the Goofy roller coaster! WAIT! Dumbo is flying in the wrong direction! Oh, I know…these are east coast Dumbos…I do know west coast Dumbos fly counter-clockwise! You have a good eye for detail! Was there yesterday with friends. We heard a rumor it would open and unlike AVATARland, this expansion I was excited about! The detailing and theming was great, especially around the new Fantasyland Train station. We even sneaked a few over the wall pictures for fun, but they turned out awful. XD One thing I noticed was a small ToonTown Fair building on the other side of the railroad tracks, will that be removed? It seems really out of place now. I don’t have any dates yet. Keep checking back!